The ‘Alpine Research and Education Station Furka’ (ALPFOR) is managed by the non-profit association ALPFOR, which is related to the University of Basel. ALPFOR is situated close to the summit of the Furka Pass at an elevation of 2435 m a.s.l. in the Swiss Central Alps, canton Uri (46°34’36” N, 8°25’17” E). The nearest larger community is Andermatt at the Gotthard Pass Road to Italy with approximately 1300 inhabitants. Land owner is the Korporation Ursern (a regional authority). ALPFOR is placed in a small zone of mesozoic calcareous layers (‘Ursernzone’) within the granitic, gneissic, and phyllitic (mica schist) core of the central Alps. The pass itself and the summits around, with elevations above 3500 m a.s.l., form the watershed of three major European river systems (Rhone, Rhine, and Po). All glaciers around the Furka Pass are at a rapid retreat, accompanied by permafrostPermafrost is frozen ground that remains at or below zero degrees Celsius (32 degrees Fahrenheit) for two or more years. It forms in regions where the mean annual temperature is... More thawing, rock glacierA glacier is a large, persistent body of land-based ice that forms over many years where the accumulation of snow is greater than its loss (ablation). The ice in a... More melting, and the release of new terrain from ice. Floristically, the Furka Pass is one of the richest parts of the Alps, i.e. within 1 km around the ALPFOR station, the alpine floraThe plants that live in a particular region, habitat or time (such as geological period like the jurassic). For animals, we use the term fauna, and to collectively refer to all... More comprises close to 300 species of flowering plants, which is more than half of the total Swiss alpine flora. This biological richness is explained by the local geologyThe study of the solid Earth, rocks and processes by which rocks form. 'Geo' is derived from the Greek word for Earth.... More and the topographic diversity. By area, the two largest habitats are alpine grassland dominated by Carex curvula and open fell field/rock vegetation. There are wet and very dry microhabitats (cotton grass – Eriophorum sp, and succulents – Sempervivum sp). ALPFOR adopted three buildings from the former military station in 2008-2011. House Carex (a former health station) is mainly used by permanent staff. It offers beds for 12 people in two storeys. House Rumex (also two-storey) has a small lecture room for 25 people, a ‘Flora gallery’ and a little tea-kitchen in the basement, and a 10-bed dormitory in the upper floor. 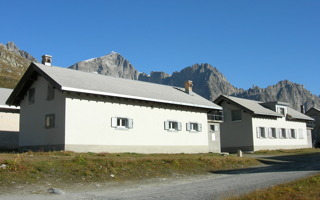 House Ibex (former canteen and accommodation for officers) is a three-storey building with a large kitchen, a dining hall/lecture room for up to 100 people, and eight rooms with 2-4 beds. Several working rooms and modern sanitary facilities are offered in all three houses. ALPFOR can host up to 30 visitors at a time. The Furka Pass is an ideal region for alpine research. Since 1991, diverse studies have strongly shaped our understanding of the alpine ecosystem, which contributed to ‘Alpine Plant Life’ (Ch. Korner, Springer Publishers, 2003). Major research projects at ALPFOR deal with the influence of elevated CO2 concentration on growth, productivity, and water relations of alpine grassland and glacier forefield vegetation; the impact of nitrogen deposition, climatic warming, and sheep trampling on alpine grassland; microclimatology of alpine vegetation; population biology and reproductive ecology of alpine plants; molecular genetics of alpine plant populations (gene-ecology); hydrological consequences of land use change. For an overview on these research projects see: pages.unibas.ch/botschoen/alpfor/research.shtml. We offer alpine ecologyThe study of living organisms in their environment, including where they are found and how they interact with their physical environment and with each other, for example through food webs.... More summer courses to undergraduate and graduate students. Our students prepare for the summer school through a web-based teaching tool (English and Spanish version) that is freely offered to all users (www.alpandino.org). The major human influence in this area is pastoralism, which have existed here for more than a thousand years and is currently in rapid decline at lower elevations (with massive Alnus shrub encroachment). Higher elevations are facing uncontrolled increases in the number of sheep, leading to an intensifi cation of grazing on the remaining, easily accessible parcels. The Alnus problem is the most immediate threat, because it leads to soil acidification, nitrogen eutrophication, plant diversity decline and it prevents natural reforestation by indigenousBelonging to a certain place. Indigenous people are distinct ethnic groups that have historic connections to people who lived in a territory prior to the area being colonized or coming... More species (pristine forest was cleared already in the 11th century). The Furka Pass Road is open from May to October. The station is open from the 1st of June to the 30th September. There is a postbus service from Andermatt and Oberwald twice a day from each side of the pass. Andermatt and Oberwald have train stations less than 15 km away from the Furka pass. The link to the main Swiss rail system is at Goschenen. A trip from Basel or Zurich takes approximately three hours.